Alesund is one of the prettiest ports in Norway with elegant buildings the city is known for its architecture in Art Nouveau style. 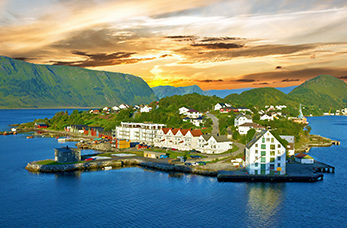 Alesund's major attractions are its surrounding fjords and the stunning high peaks of Sunnmore Alps. If you want to see some of the most spectacular vistas and panoramic views of the beautiful town centre then a visit to Mt Aksla viewpoint is certainly for you. Either climb the 418 step or drive all the way up. Valldal is famous for its natural wonders and fertile ground ideal for growing local produce such as cherries, apples, raspberries and strawberries. Visit local restaurant Jordaerstova and order their famous strawberry cake, delicious! A beautiful open air museum made up of 55 old and distinct houses. Get an insight into the life of the people who have lived here for centuries. Visit one of the largest saltwater aquariums in northern Europe. Experience the touch pools and activity pools or try fishing for crabs. This architectural gem has a lovely view of the surrounding islands and vast ocean. Norway’s most famous big wall "The Troll Wall" has long been a prestigious goal for climber. Rising 1,000 metres high from the valley to its summit. This beautiful island is dominated by Mt Storhornet and the large lake Alnesvatnet and is famous for its beautiful nature. Make sure you visit the lovely lighthouse for stunning views of the sea, fjords and Alesund.